1 3/4" = (45mm) Wide. 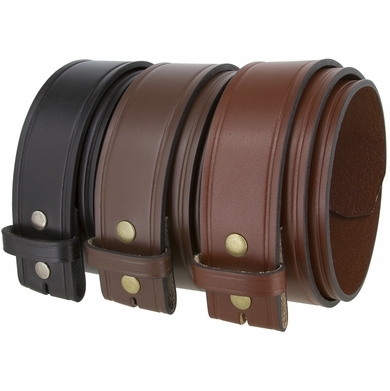 The belt strap comes in three different colors that you can choose such as black, brown and tan. One piece full grain cowhide leather belt strap very smooth with one line in each side of the belt strap. Two snaps to change to your favorite buckle. Belt strap is measured from where the leather ends at the buckle end to the middle hole at the tip end. In order to get your size, measure a belt that currently works for you from the fold where the buckle is to the hole where you wear the belt. That size in inches will be your belt size, just round the number if you get an odd number.